Culture Shops has been hard at work in partnership with Blackpool Neighbourhoods Service, CVS and The Big Local Revoe, with support from Ward Councillors Graham Cain and John Jones, to get the new Information Hub at 77-81 Central Drive ready and ship-shape for its official launch on Saturday 15 June. Volunteers have been working tirelessly to create a friendly hub where people from the local community can come and find out more about the Revoe Big Local and how they can get involved and make a difference. 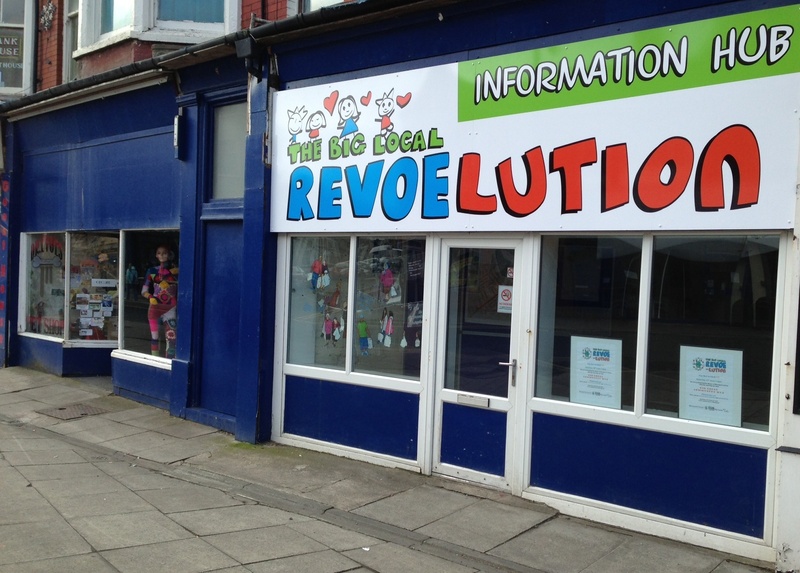 The Revoe Big Local is being opened by The Worshipful the Mayor of Blackpool, Councillor Eddie Collett at 1pm, and there will be entertainment, activities and refreshments for all the family. This is also the last weekend that the Round 2 Culture Shops artists will have their work on display before the new round of artists install their work next week, so please do come and have a look at the fantastic installations by Boz & Mr Dee, Aunty Social and Brendan Bunting. The Big Local Revolution Information Hub launch is Saturday 15 June, 1-4pm, and thereafter it will be staffed by volunteers every Thursday, Friday & Saturday afternoon.